Because they benefit from access to natural, unfiltered sunlight and require large amounts space, housing turtles in an outdoor pond is a great way to maintain them. Turtles are relatively easy to contain; a relatively small, smooth wall will keep them in the area you designate. While large turtles may be safe from most threats, small animals will be safer if you incorporate a lid as well. A basic wall made of virtually any smooth, waterproof, non-toxic material will work well -- metal, plastic, cement and wood treated with animal-safe water sealant are all satisfactory materials. All materials have their pros and cons -- wood is inexpensive but difficult to waterproof, cement is incredibly durable but very hard to install, plastic is easy to work with, but expensive and flimsy. You will have to custom design the wall for your pond; in general, you can pour a cement wall, build a cement block wall or construct a frame to hold flat panels of plastic, metal or wood. Don’t place a wall right beside your turtle’s pond. You should provide a land area for even the most aquatic turtles -- even if you provide them with logs, branches and rocks for basking, females should have a place to dig and deposit their eggs. Aside from your turtle’s needs, you'll need to tend to the pond from time to time; a wall complicates the process and represents a tripping hazard. At the very least, the turtles should have a land area that is about half the size of their water area, but ideally the fence should be at least 6 feet away from the water in all places. 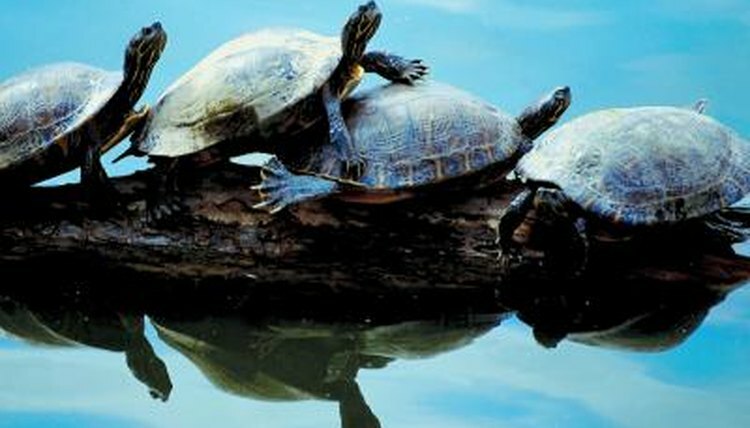 While most turtles are not good climbers, a few species do exhibit some climbing ability. If you make sure the wall is smooth and twice as tall as your turtles are, they are unlikely to climb out. However, unless it's very tall, many predators or unauthorized humans will be able to get in. The only way to guarantee your turtle’s safety is to enclose the entire pond with a lid or roof; however, a large, deep pond provides some safety to the turtles, who will respond to threats the same way they do in the wild: sliding into the water. Branches or rocks in the middle of the pond -- outside the reach of predators -- will give your turtles a pretty safe place to sleep at night. Because herons and other birds will readily eat small turtles, keep turtles less than 4 inches in length indoors if you don't use a lid. Keeping your turtles from digging out of the enclosure is only half of the battle -- you must keep predators and rodents from digging their way into your turtle’s home as well. Very large turtles are pretty safe from most predators, but small individuals are susceptible to predation by dogs, raccoons, rats and many other animals who may tunnel into the enclosure. You can insert the wall material down several feet into the ground to reduce the possibilities of this happening. Alternatively, a large, deep layer of gravel placed around the inside and outside of the wall will help discourage tunneling by all parties.